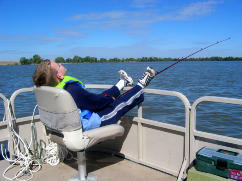 The biggest worry for most boaters is simply when to find time to use their boat or pontoon. We hope that's your only worry and not whether your boat or pontoon and your passengers are protected while you're out on the water. Unity Insurance and Investments writes with specialty companies whose focus is on the "toys" you enjoy such as boats or pontoons. We can help you decide on the types of coverage you should be carrying depending on the nature and frequency of your use. a perpetual series of hope." for Boat or Pontoon Insurance.